The new International Fair Trade Charter enshrines the common vision and fundamental values of the Fair Trade movement to put us on the path to realising the Sustainable Development Goals. Rising inequality, entrenched poverty and a deepening ecological crisis have led the global community to seek new models of business and trade that drive fair and sustainable economies. 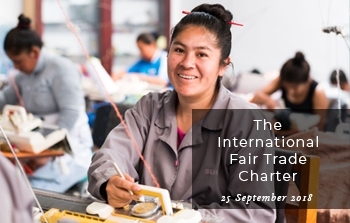 Get a copy of the International Fair Trade Charter and support Fair Trade here www.Fair-Trade.website. The Charter is also available in other languages.